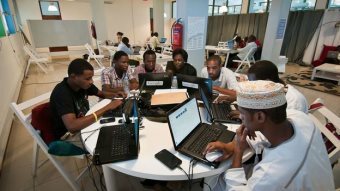 AFRICANGLOBE – When things turned ugly after Kenya’s 2007 elections, an unlikely group of heroes — young African coders — developed a platform that used cellphones and the Internet to track the violence. Ushahidi, as it was called, would go on to transform not only government accountability in Nairobi but, more broadly, digital mapping around the world. With seven of the world’s 10 fastest-growing economies now located in Africa, the importance of mobile technology cannot be overstated. Indeed, this focus on mobile isn’t just changing Africa, it’s changing the world. Ushahidi has been used to find survivors of the 2010 earthquake in Haiti, to track the impact of the BP oil spill, and for outlets like The Huffington Post and Al Jazeera to gather news otherwise unreported. What also sets African innovation apart is a core understanding that technology must work for residents in both bustling modern cities, such as Nairobi or Cape Town, and the rural areas that are still home to half the world’s population. Consider M-Pesa, the world’s first mobile banking service. Also developed in Kenya, it is exactly the kind of technology that taps into these two different customer bases. M-Pesa — the “m” for mobile, “pesa” is Swahili for money — allows users to send and receive funds on their phones, dramatically cutting the time once needed to pay electricity bills in person or deliver money to a sick relative by bus. M-Pesa has already expanded to South Africa, India, Afghanistan, and Tanzania — and is even available in the United States for the African diaspora. In 2011, more than 50 similar mobile-money startups were launched in Africa. Nor, however, is innovation limited to mobile. The team at Ushahidi went on to develop BRCK, a block designed to provide a reliable Internet connection anywhere in the world — “from remote and rugged locations to your corner cafe,” the company brags. Safaricom, the company that launched M-Pesa, is behind the effort to equip Nairobi’s public minibuses with high-speed wireless Internet. Plus, while Kenya is the undisputed leader, similar development is occurring across Africa. Easy Taxi, a service connecting users with cabs at the click of a button, first launched in Lagos. Communities in rural Malawi are combatting deforestation using GPS, and, in Mali, the IKON Tele-radiology initiative has made it possible to receive X-ray scans and diagnoses over the Internet from remote areas. Many of these technologies are born out of the less romantic side of Africa — they’re often filling the gaps left by corrupt governments and failed infrastructure. And yet those origins don’t make this burgeoning innovation any less of a bright spot on a continent rarely given the benefit of a hopeful future. Previous articleV. Stiviano Attacked By Two White Males In New York?